Hello, everyone! Welcome to another episode of Much Abrew About Nothing. Generally, we play Instant Deck Tech decks for Much Abrew, but we are changing things up a bit this week. I've commandeered the series for a week to show off The Pirate God, which might be my favorite deck in Standard at the moment. The Scarab God is an incredibly powerful card, and there's a solid argument that it might be the best card in Standard. Because of this, one of the easiest ways to win in Standard is to build the best The Scarab God deck. So, which The Scarab God deck is best? One stuffed full of Pirates, of course! Siren Stormtamer, Kitesail Freebooter, and Hostage Taker are powerful cards on their own but even more potent in conjunction with The Scarab God, since they help protect our namesake mythic while also being amazing when they come back from the graveyard as 4/4s. 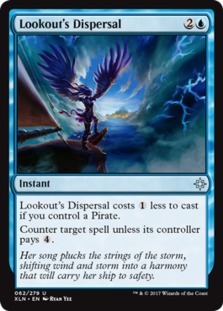 Plus, playing a bunch of Pirates means we get Lookout's Dispersal as an upgraded Mana Leak. Can the combination of The Scarab God and Pirates work in Standard? Let's get to the videos and find out; then, we'll talk more about the deck. The Pirate God is basically a tempo-based, tap-out control deck. While we end up in the control role in most matchups, we aren't your typical draw-go control deck. Instead, we are looking to use our mana every turn to advance our board with disruptive creatures before finally finishing the game with The Scarab God, Liliana, Death's Majesty, or even our opponent's best creature with the help of Hostage Taker. The Scarab God is insane in just about every possible way. As a creature, a 5/5 for five is already on curve, not to mention the fact that The Scarab God is super hard to kill with most removal spells. More importantly, the ability to eternalize any creature for four mana at instant speed means we generally just win the game if we can untap with The Scarab God. As such, my thinking on Standard right now is that the goal should be to build the best Scarab God deck possible. The card is that good. While a lot of decks are playing The Scarab God, what makes our deck unique are the Pirates. While it might not be obvious at first glance, Pirates work incredibly well with The Scarab God on two different levels. 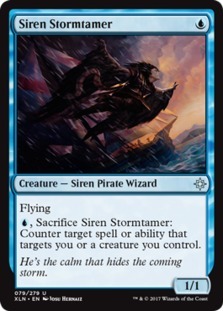 First, Siren Stormtamer and Kitesail Freebooter protect The Scarab God on the battlefield, with Siren Stormtamer countering things like Vraska's Contempt for just a single mana and Kitesail Freebooter preemptively pulling Cast Outs and other answers from our opponent's hand. Second, both Siren Stormtamer and Kitesail Freebooter are excellent cards to eternalize with The Scarab God in the late game, coming back as 4/4 fliers while also disrupting the opponent. 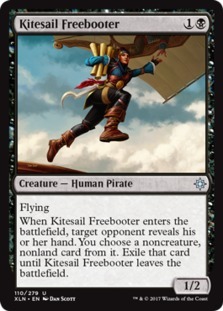 Since The Scarab God's ability works at instant speed, we can even do tricks like getting back Kitesail Freebooter during our opponent's draw step to Duress away whatever card they happened to draw for the turn. Oddly, while our cheap Pirates might not look like much, they actually do a surprisingly good job of pressuring the opponent. Since they having flying, they are unblockable in most matchups, which means they start chipping away at our opponent's life total turn after turn. After a while, this adds up to a meaningful amount of damage, and backed by our removal and disruption, we do occasionally win games with janky Pirate beats, without drawing our finishers. 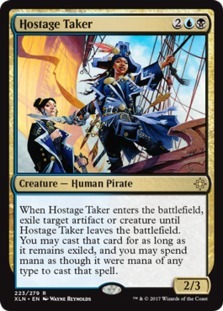 Our last Pirate is probably the best of the crew: Hostage Taker. The four-mana Pirate is a good card on its own but is even better in our deck, since it gives us another Pirate to turn Lookout's Dispersal into an improved Mana Leak and is great when it comes back into play, thanks to The Scarab God in the late game. 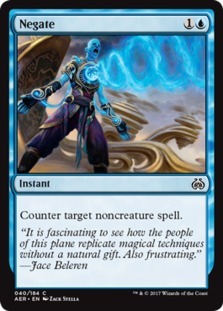 It also gives our blue-black deck a sneaky way to deal with opposing artifacts, a card type the color combination typically struggles to deal with. It's also worth mentioning that we occasionally use Hostage Taker on our own creatures. While it probably sounds strange, exiling and recasting something like Champion of Wits is actually a fairly strong line, or we can use Hostage Taker as wrath protection by exiling one of our creatures so we have something left on the battlefield if our opponent Fumigates. All around, Hostage Taker is a strong card in most matchups and one of the key pieces of our deck. We have a handful of non-Pirate creatures in our deck as well. 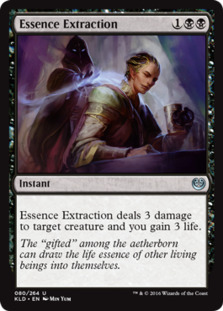 Gifted Aetherborn is key to staying alive against aggressive decks like Ramunap Red while also taking down big hard-to-deal-with threats like Carnage Tyrant thanks to deathtouch. Plus, it's pretty good when it comes back as a 4/4 thanks to The Scarab God. 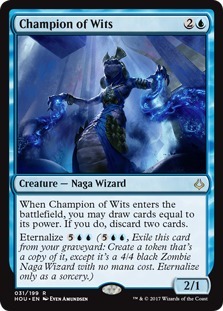 Champion of Wits is the glue that holds the deck together, filling our graveyard for The Scarab God, allowing us to loot away cards that are bad in specific matchups (like Fatal Push against UW Control), and also helping us dig for our Pirates and The Scarab God. 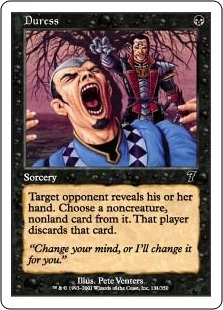 If we ever get to the point in the game when we are eternalizing Champion of Wits, it's really hard to lose thanks to the card advantage it generates, especially considering that once we start drawing four and discarding two, it's pretty easy to start chaining copies together to refill our hand. 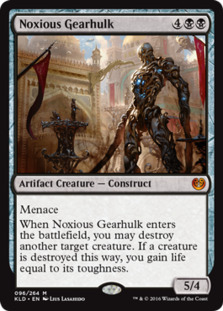 As for Noxious Gearhulk, it was in the deck as an answer to Dinosaurs, which were pretty popular on Magic Online when I first started playing the deck. The Dinosaur deck died down a bit over the past week, which means Noxious Gearhulk might not be worth a main-deck slot. 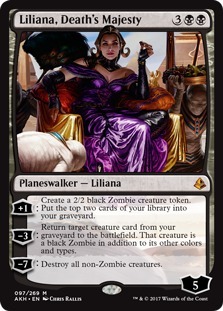 Liliana, Death's Majesty is only a one-of, but it adds a lot of value to the deck at the top end of the curve. Against control decks, it gives us another repeatable source of card advantage; against midrange, it clogs up the board with Zombie tokens, plus it can reanimate random creatures like Siren Stormtamer, Kiresail Freebooter, and Hostage Taker. On the other hand, Liliana, Death's Majesty is a bit slow against Ramunap Red, so if the aggro deck continues to rise (it was the most played deck at Worlds this weekend), it might be right to move Liliana, Death's Majesty into the sideboard in favor of some main-deck copies of Essence Extraction. Lookout's Dispersal is the biggest reason to play a bunch of Pirates. Mana Leak is on the list of cards that Wizards tends not to reprint in Standard because they are too good, and Lookout's Dispersal gives Pirate decks a counter that's even better than Mana Leak. With a Siren Stormtamer on Turn 1, Lookout's Dispersal can counter our opponent's two drop. Meanwhile, later in the game, Lookout's Dispersal is cheap enough that we can deploy a threat while still leaving up an answer to Hazoret, the Fervent, The Scarab God, Approach of the Second Sun, or any other hard-to-deal-with cards our opponent might have in their deck. As for removal, we have a few different options. 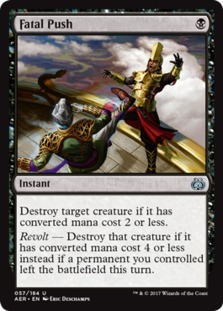 Fatal Push is our best early-game removal spell, and while we don't have a ton of ways of triggering revolt, we can often figure out a way to kill bigger creatures with the one-mana instant as the game goes along. Vraska's Contempt is basically the opposite of Fatal Push, being far from efficient but able to kill anything, including Hazoret, the Fervent and opposing The Scarab Gods. 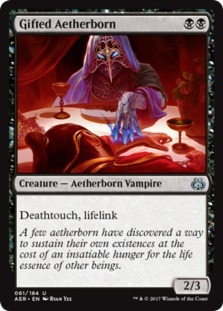 Plus, the lifegain is a nice bonus that helps make up for its four-mana cost. Our other removal spells are just one-ofs, mostly because they are sorcery speed. 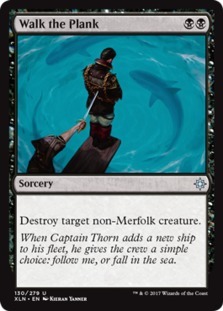 Walk the Plank actually hits a lot of things since Merfolk aren't really a thing at the moment. 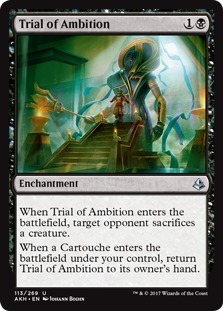 while Trial of Ambition is another way to deal with indestructible Gods like Hazoret the Fervent and also hexproof threats like Carnage Tyrant. This is pretty much our control package. If we run into UW Approach or any of the various Ux Control decks, we can take out all of our spot removal and some number of Gifted Aetherborn and / or Hostage Taker and bring in a bunch of discard and counters along with a couple more planeswalkers. 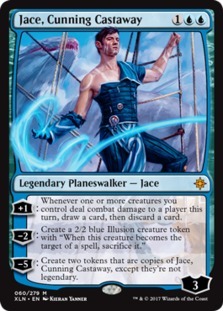 Jace, Cunning Castaway started off in the deck mostly because I wanted to test it out, but it is actually pretty good against control decks, coming down on Turn 3 underneath opposing counters and taking advantage of the fact that Siren Stormtamer and Kitesail Freebooter give us cheap creatures to trigger the looting +1. While I'll probably end up taking it out eventually, at this point it's been good enough to keep in the sideboard. This is our aggro package. While I still don't really like Bontu's Last Reckoning, we don't have a ton of wrath options in blue and black at the moment, so it makes the cut as a way to fight against various Dinosaurs decks (although it might not be as needed anymore, since Dinosaurs hasn't really taken off). Meanwhile, Essence Extraction is key to beating Ramunap Red, where it kills anything at instant speed while also gaining us some life to swing the race in our favor. While Doomfall isn't great at anything, it does enough important things that it's one of the best sideboard cards in Standard. 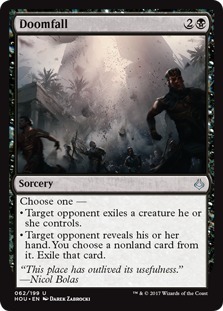 It can come in as yet another way to kill Hazoret the Fervent and Carnage Tyrant against creature decks, while also coming in as an overcosted Thoughtseize against control. This versatility helps make up for the fact that both modes are overcosted. All in all, we pretty much crushed our league, not just going 5-0 in our matches but 10-1 in our games, with our only loss coming to a deck that looked a lot like ours (sort of a pseudo-mirror). More importantly, we played a pretty good sample of the best decks in Standard, handling UW Control and the mirror on the more controlling end of the spectrum, Grixis Tezzeret and Sultai Energy from the midrange crew, and Ramunap Red as the premier aggro deck in the format. This highlights one of my favorite parts of The Pirate God: it feels like it has a reasonable chance of beating just about anything. If we run into control, we've got a ton of discard, strong planeswalkers, and The Scarab God itself. Versus midrange, we have Hostage Taker and The Scarab God, and versus aggro, we've got Gifted Aetherborn, strong sideboard cards, and a bigger end game. This isn't to say we are favored in all of these matchups, just that I don't think any of these matchups are really bad. 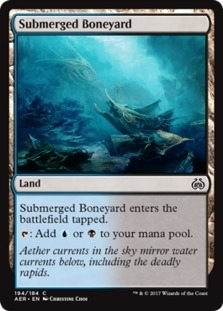 As far as changes I'd make to the deck, Submerged Boneyard should probably be Evolving Wilds for Fatal Push value, and with Search for Azcanta being on the rise, we might need some number of Field of Ruins as part of the mana base. Noxious Gearhulk might not be necessary at all, since Dinosaurs don't really seem to be a thing at the moment, and Essence Extraction might deserve a home in the main deck, since the decks it's good against (various energy decks and Ramunap Red) are near the top of the meta. 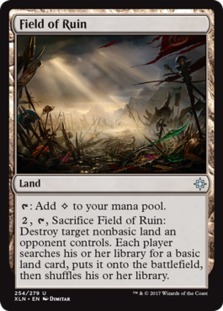 Otherwise, I'm really torn on Search for Azcanta, mostly because we don't have that many spells in our deck (a total of 13 non-land, non-creatures in the main deck). While the enchantment is strong and maybe it's good enough for the front half, even with the odds that we'll whiff quite a bit once we flip, I'm not entirely sure at this point. In sum, The Pirate God felt legitimately good. The Pirates open up some interesting possibilities over more traditional spell-based blue-black decks, not just being good with The Scarab God but also giving us this weird backup plan of going beatdown with small fliers backed by a Mana Leak in Lookout's Dispersal. The Scarab God and Hostage Taker are among the best cards in Standard, upping the power level of the deck, and the support package is about as good as it gets in Standard, with solid removal and discard that can deal with most threats in the format.